Queen Omega hails from San Fernando in the caribbean island of Trinidad. Encouraged by her mother (to whom she pays moving tribute on "Mama"), she began entering local talent shows from the age of nine, writing her own calypsos and even rapping on national television. Later on she sang backing vocals for local producer Kenny Philips, accompanying numerous top Soca acts both in the studio and on stage. Raised in a musical family, shed grown up listening to soul artists like Aretha Franklin, Anita Baker and Whitney Houston, as well as jazz and the traditional music of Trinidad. Such foundations were to serve her well later on; her favourites however, were reggae and dancehall. Inspired by the teachings of Emperor Haile Selassie I, her song writing skills soon blossomed, with roots and reality themes coming to the fore as her love of Rastafari deepened. It was on a trip to Jamaica with the Solomon Band where she performed at the Caribbean Music Expo in late 2000 that she met producer Mickey D, who brought her to London the following year for sessions that resulted in her debut set, "Queen Omega". This was followed by several hit singles and a second album titled "Pure Love". Early 2004 Jet Star released "Away From Babylon", Queen Omegas third and most accomplished album then, finding her still residing within Mickey D's Green House Family. 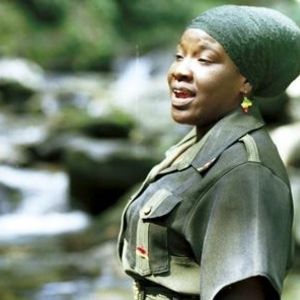 With these three albums and many well received live performances, Queen Omega has been absolutely blazing a trail for female roots reggae artists. And she continues to do so with this brand new collection of tunes. Now under the wings of the very talented French production Bost & Bim & the label Specail Delivery Music, she shows that she has improved her vocal delivery further. She mixes her standard singing with deejaying, and is equally efficient at doing both. Besides that she once again fully showcases her devastating ability to write to the point messages. Thus Queen Omega is well on her way to creating a sort of consistency the roots side of reggae has never had from a female artist. Queen Omega has been touring several time in Europe (France, Germany, Switzerland.. ) and performed on few of the biggest reggae in event like SNWMF (USA), JaSound (France), African Music Festival (Germany).